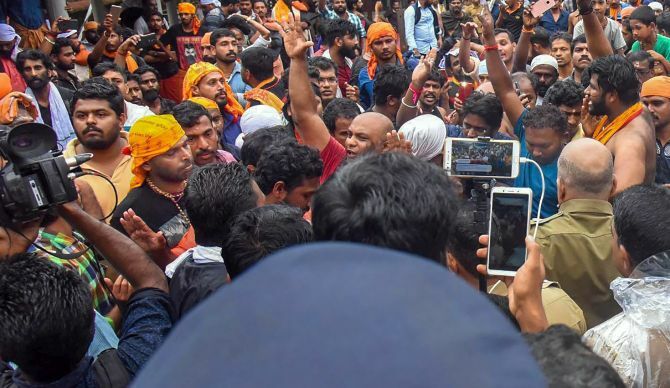 Four women were prevented from the entering the Sabarimala temple on Sunday by a large number of devotees of Lord Ayyappa as the stand-off over entry of women of menstrual age into the famous hill shrine continued for the fifth day. 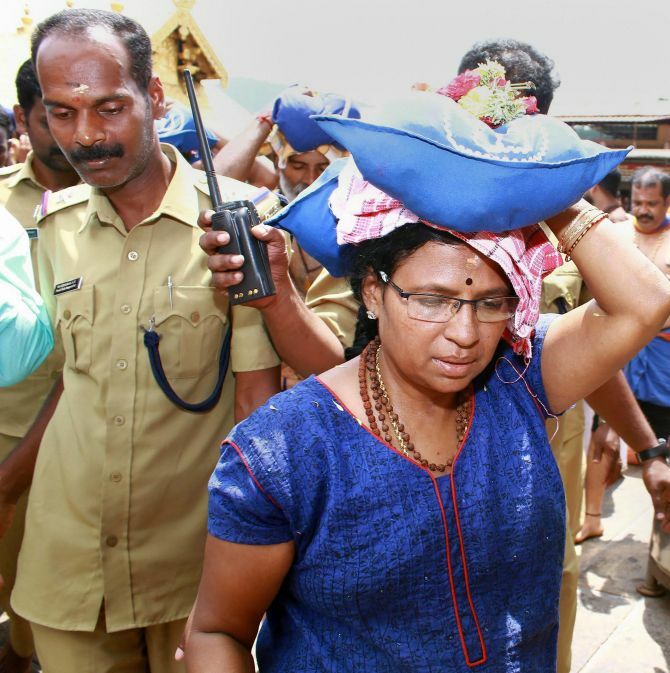 The devotees, up in arms against implementation of the Supreme Court order lifting ban on entry of women in 10-50 age group, chanting Ayyappa mantras blocked the four Telugu speaking women from reaching the famed shrine amid high drama. Sunday is the fifth day since the temple gates were opened for the monthly puja after the apex court last month lifted the centuries-old ban. Though attempts were made by some young women, including an activist, to enter the temple of the ‘Naishtik Brahmachari’, the eternally celibate deity, since Wednesday, the devotees backed by priests have stood their ground, saying they would not allow the tradition to be breached. By all available indications, not a single woman in the age group of 10 and 50 has so far reached the temple which will close Monday at the end of the monthly puja. BJP demanded a special assembly session to seek the Centre’s intervention, while the Congress sought an ordinance by the National Democratic Alliance government. The Pandalam royal family, the traditional custodian of the Sabarimala temple, alleged the Communist Party of India -Marxist-led Left Democratic Front government was trying to destroy sanctity of the shrine of the “Naishtik Brahmachari” by taking women in the menstrual age group there. On Sunday, a 47-year old woman reached up to the ‘Nadappandhal’ close to the sanctum sanctorum, but was prevented by the devotees chanting “Swamiye Saranam Ayyapa” after three others were stopped en route to the hills. The woman, who complained of uneasiness, was brought to a hospital here by the police. An elderly woman devotee who was present at the spot said as the identity card of the woman showed she was born in 1971 and had not attained the ‘permissible age’, the other devotees started chanting Sarana mantra. Earlier, the protesters prevented two women, in their 40s, at the foothills itself. The women were accompanied by their relatives. The police, who took the women to the safety, said the two informed them that they came to Sabarimala without knowing the customs of the temple.